June is LGBTQ Pride Month, bringing a celebration of love and happiness for all without judgment and prejudice. 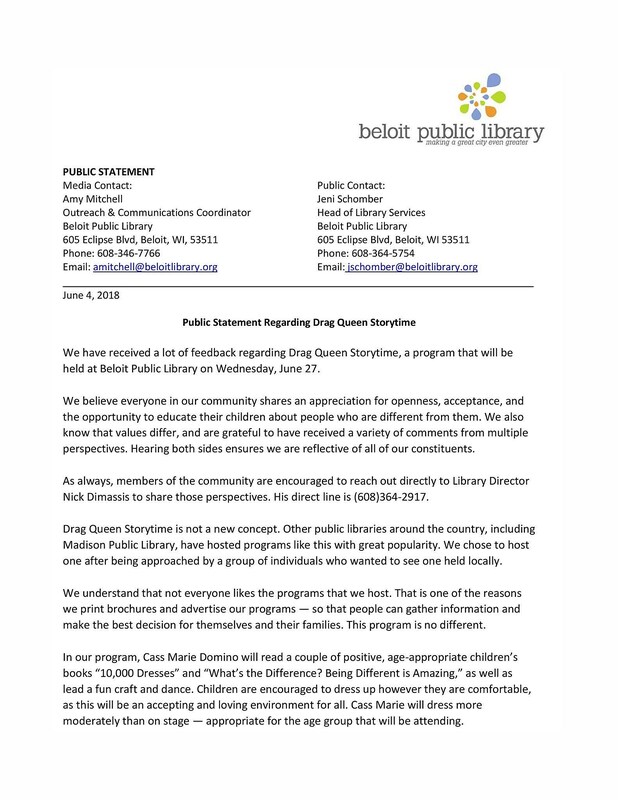 Beloit Library celebrated with an event that was attended by many, yet received mixed reactions on Facebook. One of the books read was "What's The Difference? Being Different Is Amazing." Dress-Up Drag Queen Storytime at Beloit Library is exactly what it sounds like, a drag queen reading a story to children. The library encouraged kids attending to wear their favorite costume/dress-up clothes. The event was open to the public and not mandatory, meaning nobody was forced to attend. I mention that because of negative comments on WIFR's post about the event. Some (not all) of the comments were filled with hate, judgment, anger, and obscenity, and overall evil. To be fair to both sides, I will not post the comments but, instead, post the link for you to check out for yourself. Everyone is entitled to their opinion and, yes, an individual's beliefs should be respected regardless of the extremity, good or bad. However, do our littles really think a man dressed up as a princess is anything other than a costume or playing "pretend"? Regardless of whether or not one supports LGBTQ, its hard to believe a child young enough for storytime at a library would be thinking "wow, wait, why is there a drag queen here?" That thought is something that shouldn't be in the mind of a child. As parents, my wife and I take pride in teaching our children that we're all the same regardless of gender, color of our skin, size of our bodies, age, so on and so forth. In short, God has the final judgment call, not us. If a child reacts to a man dressed as a woman in a negative way there's an adult responsible for it somewhere. Even if the child heard it from another kid there's an adult somewhere that chose to judge and mock. I've never read a book on raising children but I'll assume there's something about teaching our kids to love all somewhere in one of them. Finally, no was forced to attend Dress-Up Drag Queen Storytime, which didn't take place at a school, daycare, or camp. Also, can you be 100% sure the drag queen is anything other than heterosexual? I know men that have dressed in drag for charity and, if you're from Rockford, you probably know one, too. If a man in a dress or makeup makes him a terrible person you should add me to your list of people you don't like. I let my daughter put makeup on me and paint my nails, too.